In this video, we’re going to cover a great dinking game that we do every time we get to the courts before we start playing full doubles games. This game will have you dinking like a pro in no time. There are two variations of this game. The first is dinks only so that you can learn to really work your opponents at the NVZ line and practice dinks that are not attackable. The second is to put your dinking skills and fast hands to the test and is played at full speed with lots of dinks to start. These are two of our favorites that we do all the time. Nicole Havlicek: Hi. Welcome to PrimeTime Pickleball. My name is Nicole Havlicek. In today’s video, we’re going to cover a great dinking game that we do every time we get to the courts before we start playing full doubles games. This game will have you dinking like a pro in no time. Here’s Jordan to show us how it’s done. Jordan Briones: All right. 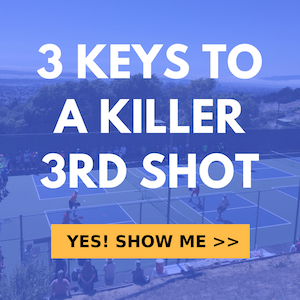 Today we’re going to go over a drill that I like to do when I first get to the court and you’re not warmed up yet. I just call this just a game to five. We’re just going to play dinks from the non-volley zone. And they don’t have – your dinks don’t have to land in the kitchen. They can land past the kitchen. But what we’re going to do is we’re just going to play this half of the court. The sidelines would be out and then if there was an imaginary line through the kitchen, that would be out. We’re just going to play all dinks. Nothing hard, no hard shots. We’re just going to try to just move the ball around and go to five points. We’re going to keep the rally going as long as we can. The main key, so like at that end of that point, I would have one. Basically you want to play to five and this is just a really good drill to do to get your dinks warmed up and you would really want to concentrate on – as you can see, we’re really leaning forward, catching every ball out in front and we’re really just trying to move your opponent around. All right. One more. Here we go. Good. OK, two all. So it’s really good. It helps you just really dial in your dinks and I’m trying to make him reach. So as he’s doing to me, I’m trying to – I’m moving him left and right, forehand and backhand and also just trying to make him hit behind him. Go ahead and go practice it. Play the five points and then also if you have other people with you, just make like a game out of it. You can do a mini tournament of this. All right. Now after you guys have played a few games to five points, hitting nothing hard, just all dinks, all soft shots, now you guys could play the point live. What we’re going to do is we’re going to just play the same thing, so five points. But now if there’s going to be a little bit higher balls, we could attack them and speed up the point just like in a real match. OK? We will play the five points again. Now this where everything goes. You could lob or you could drive or volley or hit hard ball at anytime after starting with a dink feed. Look for that ball to be lifted and go for it. Games to 5 is a great way to drill your dinks so that you can dink like a pro in no time. Nicole Havlicek: If you enjoyed this video, please give it a like. Thanks for watching. For more pro player pickleball secrets to help you play your best game, please visit PrimeTimePickleball.com. You will find a clickable direct link in the video description below. But before you head on over there, please be sure to subscribe to our channel, so that you don’t miss out on any of our future videos. Thank you for your video. They have really helped me improve my game. So happy to hear it David. Thanks for watching!